With so much of their brand recognition built upon the history of the Reverso, some of Jaeger-LeCoultre’s other pieces can often be overlooked. 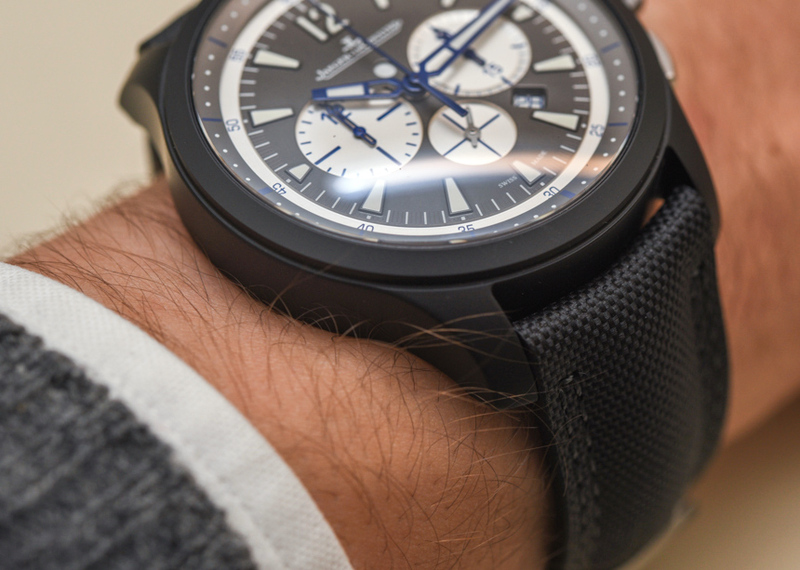 This is especially true with their sports watches, and that’s a shame, as pieces like this Jaeger-LeCoultre Master Compressor Chronograph Ceramic watch are some of the most compelling pieces on the market right now. 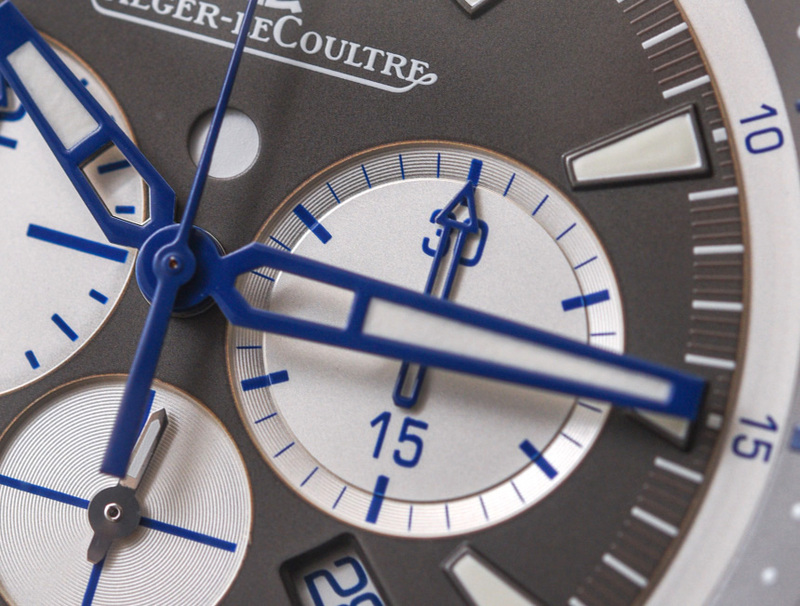 While this model isn’t new (check out the previous model we covered here), this version is an absolute stunner of a watch incorporating a new grey and blue dial that belies the restrained elegance that most might think of when approaching this brand. First, let’s take a moment to discuss the use of ceramic for the case material here. 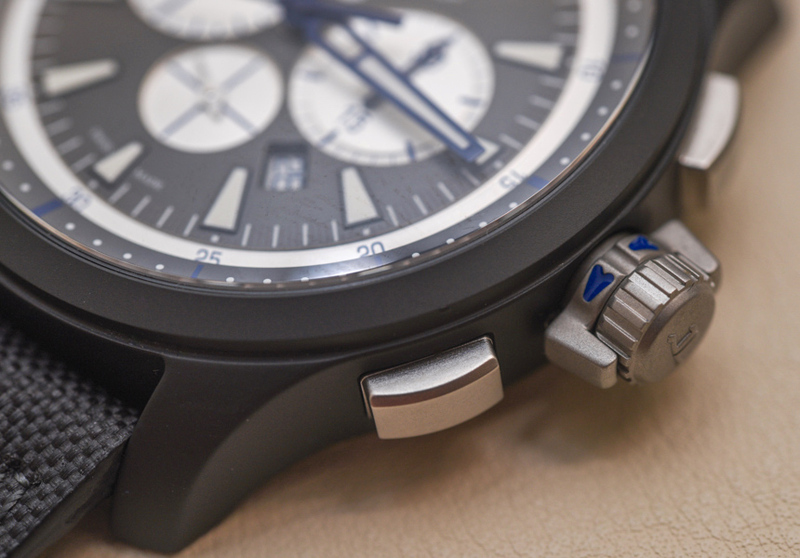 It seems as though ceramic is all the rage as a lightweight, scratch-resistant steel alternative that has slowly worked its way into components of several large manufacturers, none of which caused so much of a ruckus as when Rolex began began using the material for the bezels on their Submariners. The switch gave rise to a wave of chagrin as Sub-fans cried foul that their bezels would crack at the slightest tumble, leading to a costly replacement. But I digress. 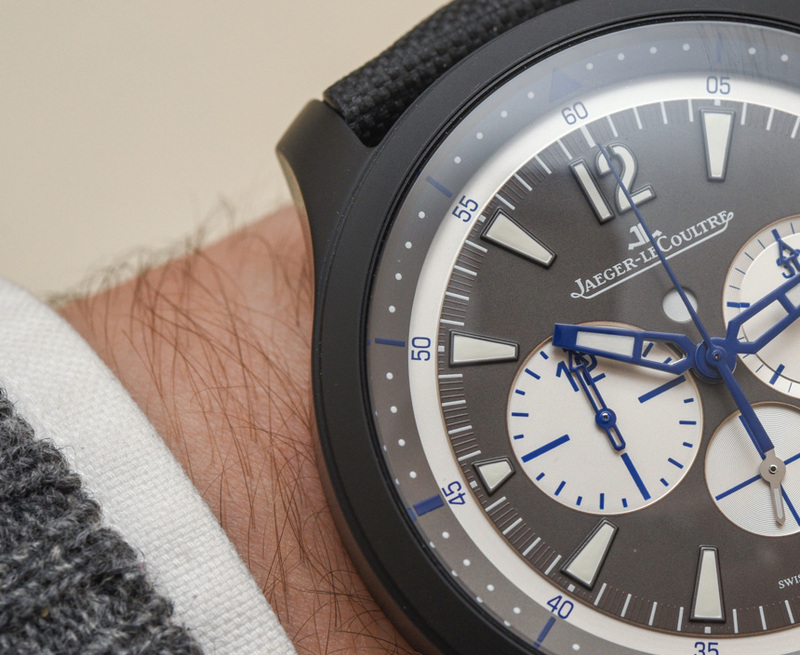 Jaeger-LeCoultre uses ceramic for the entire case here, and the result is a substantial yet lightweight piece that promises to wear easily throughout the day. At 46mm, this isn’t discreetly sized, but it’s great to see JLC appreciate and cater to the tastes of a lot of modern sports watch buyers. 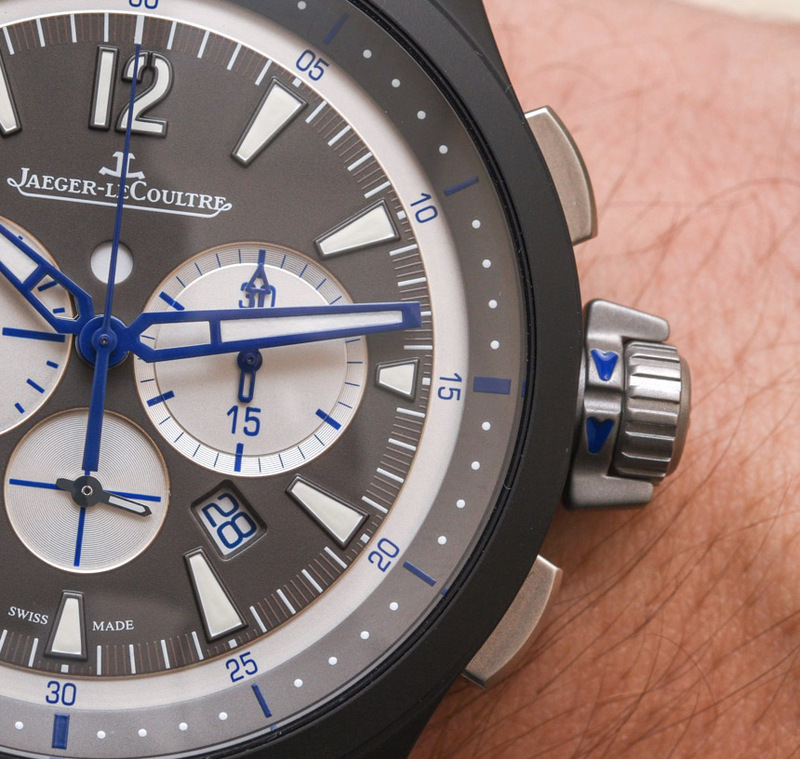 The ceramic gives it a matte-like black finish that underlines the sporty nature at play here. 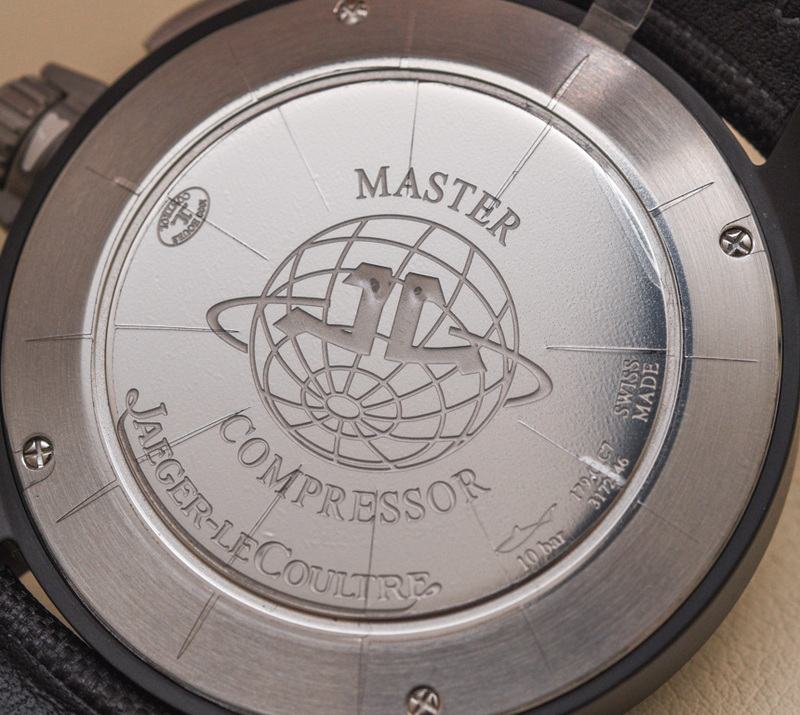 Unlike previous Jaeger-LeCoultre Master Compressor Chronographs, this Ref. 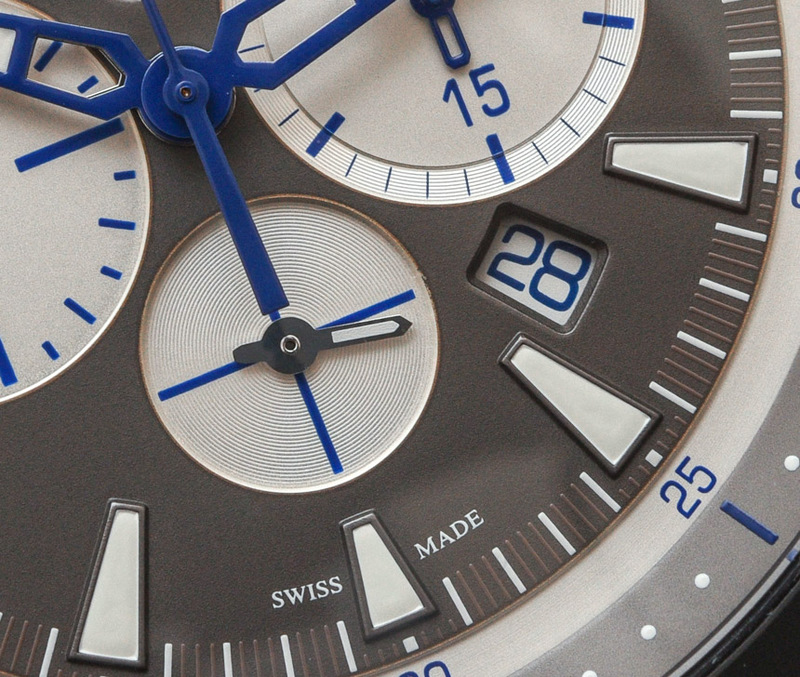 205C571 replaces the red accents with a cool blue that meshes well with the gray and black tones presented on the dial. The blue is certainly more subtle and slightly more classy, so I think it was a good choice. At 14.3mm thick, it is definitely a little heftier than other JLCs, but it isn’t too much to deal with size-wise for a watch like this. There is a day/night indicator with a small date aperture between 4 and 5 o’clock. This dial would have been fine if the date had been left out, but I know some people prefer it and, like it or not, the date window is seen as useful by many people. Either way, it isn’t too terribly cluttered and I can live with it, even given my personal tastes that prefer symmetry. The blue, partially opened hands are accompanied by a gray, subdued hand to indicate a second timezone and are treated for luminescence, as are the pointed hour markers. 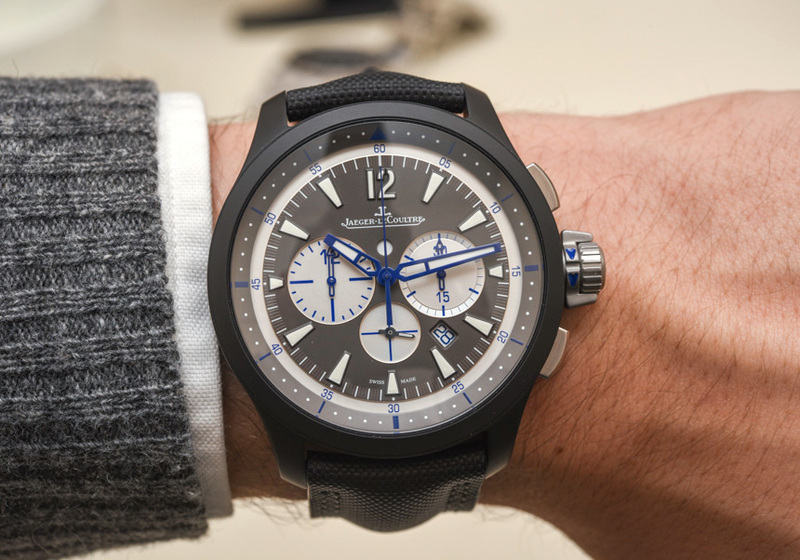 Naturally, JLC tops it off with a sapphire crystal and the Jaeger-LeCoultre Master Compressor Chronograph Ceramic promises a water resistance of 100m. Once again, JLC uses the in-house Calibre 757 that powers along at 28,800vph, made of 300 pieces, and containing 45 jewels. 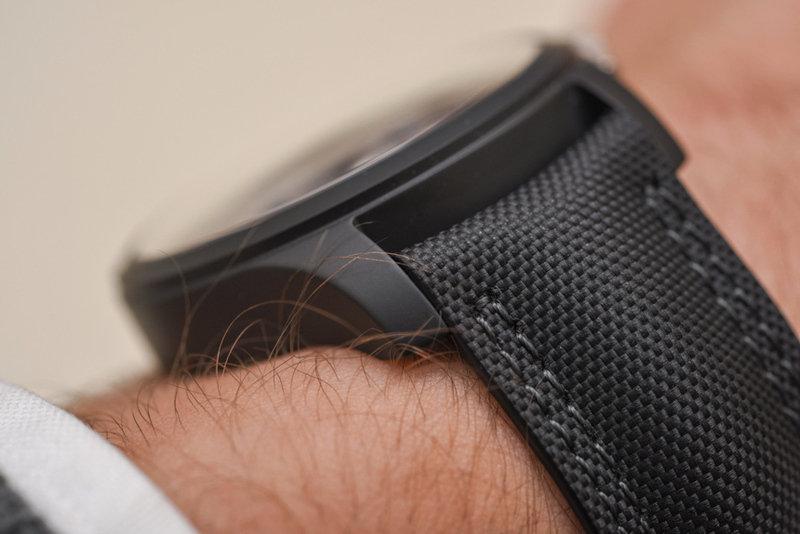 No doubt about it, this movement has proven reliable, and it offers an impressive 65-hour power reserve. It is nice to have an in-house movement offer such a high power reserve due to the fact that sometimes you get stuck with a paltry 38 hours on occasion. It is simply a great instance of a brand offering the people what they want. 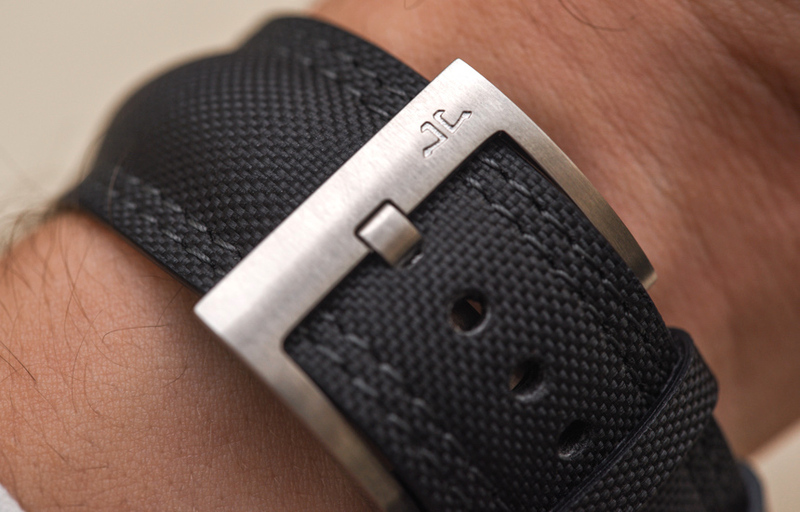 And what the people want are features like the second timezone and patented compression key for water resistance. 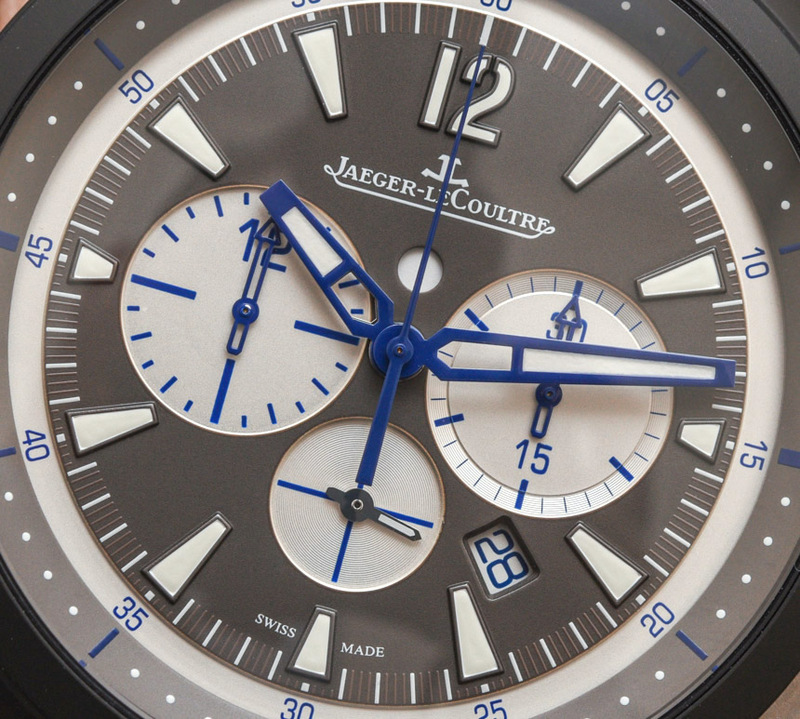 They could have just as easily added a couple of subdials and stopped there, but leave it to JLC to take put their own touches on this classic layout. 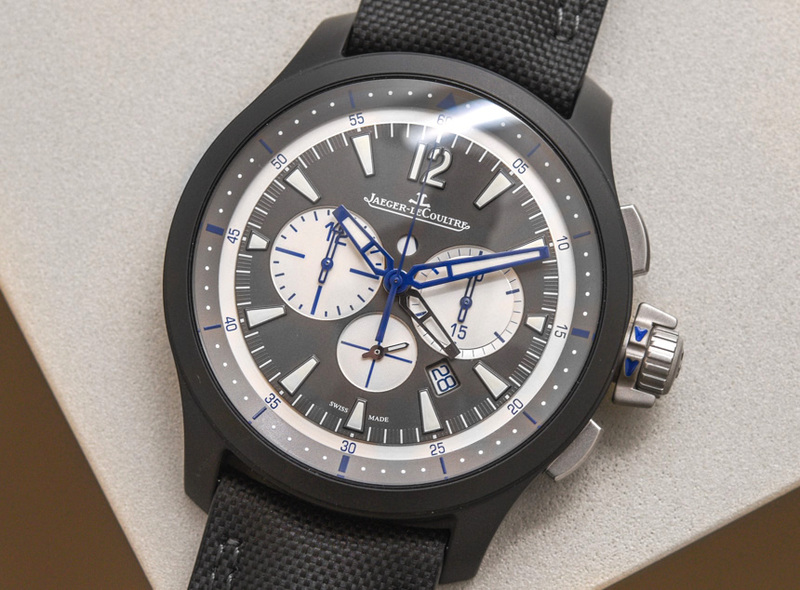 In fact, those unfamiliar with the Jaeger-LeCoultre Master Compressor Chronograph collection could be forgiven for not knowing it as such a special piece given that at first glance you just see a good-looking chronograph. The integration of these little features would have ruined a lot of other brands’ dials but, to no one’s surprise, JLC can pull off sporty with a healthy balance of symmetry. 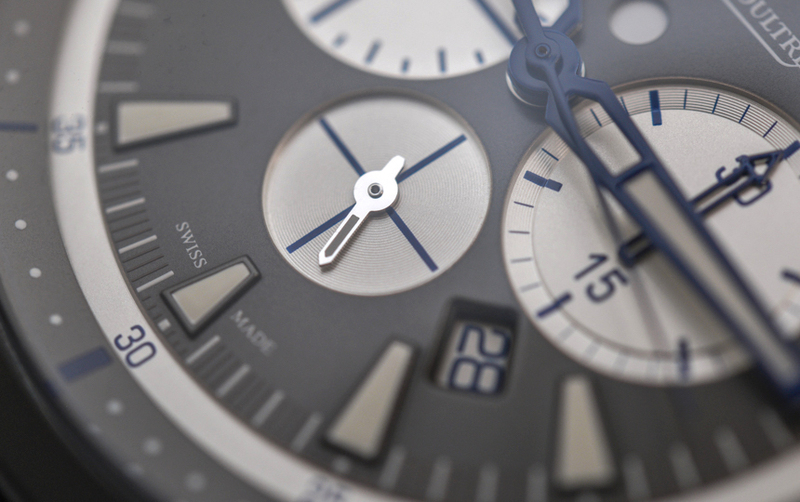 The only aspect of the dial that threatens that balance is the date window, but alas, we can’t always have it all. 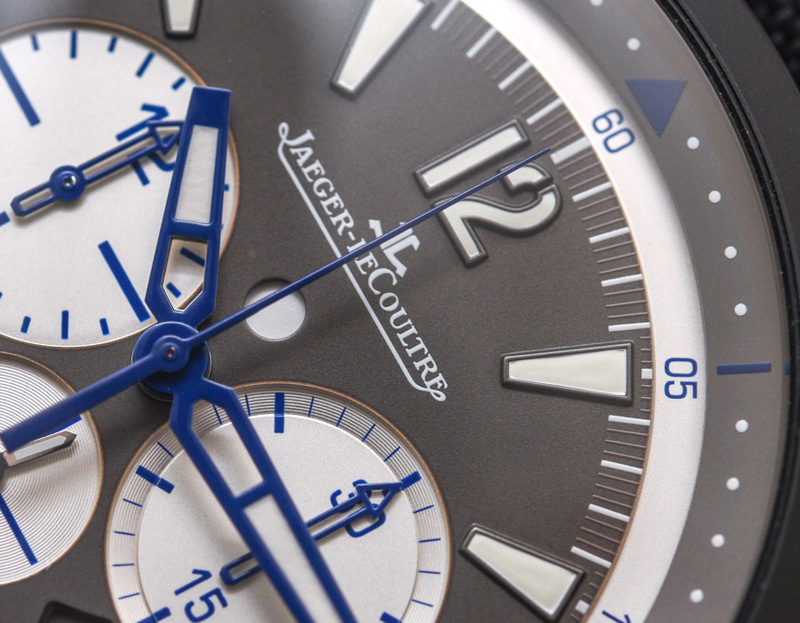 Jaeger-LeCoultre has a lot in its tool-house that goes far beyond the Reverso line. Don’t get me wrong, the Reverso is a modern legend and a true horological icon. 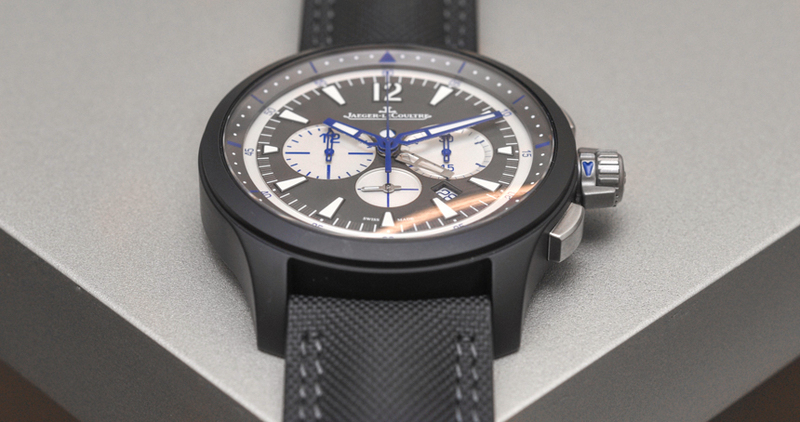 However, JLC can masterfully pull off “posh-sporty” like this, but can also take it further with pieces like the Master Compressor Extreme Lab 2 we covered last year. 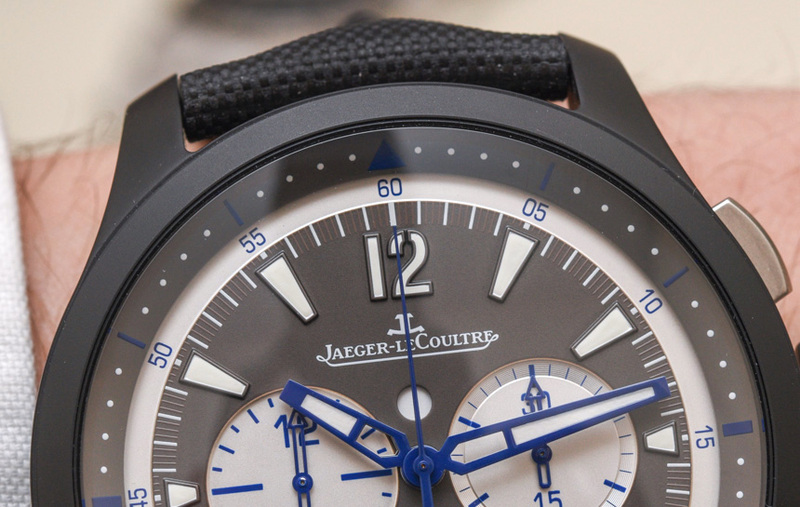 That model made use of a skeletonized dial and further exhibited the variety that can be found within the brand. 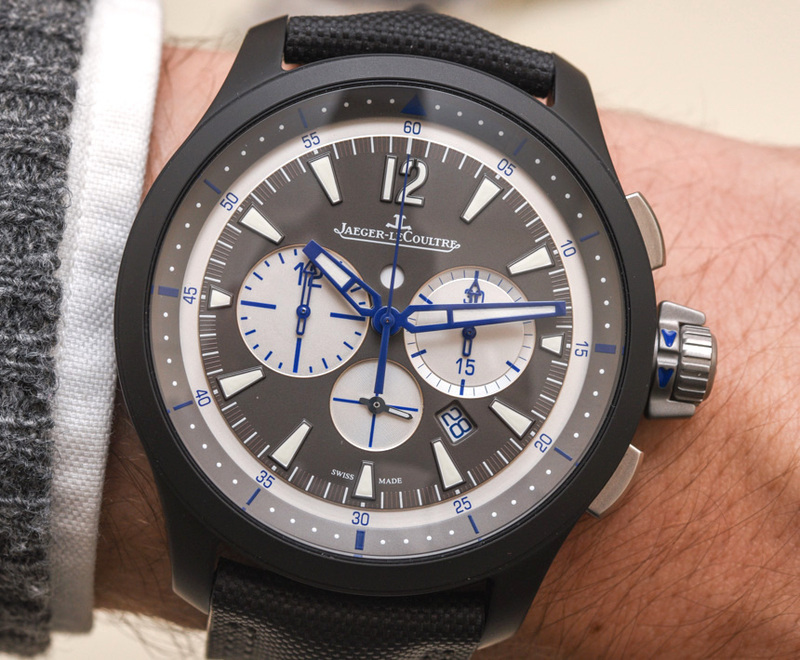 For everyday use my money would still land on the Chronograph, but JLC clearly has the ability to surprise, and I think this watch is gorgeous. 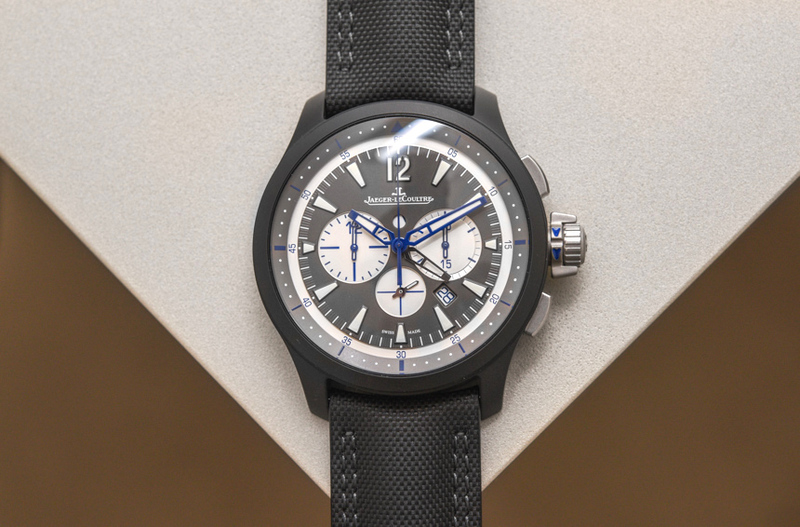 There are tons of chronographs in this ~$15,000 (give or take a few thousand dollars) range, but I think this is an option with a personality unlike the others, in a larger case than many of the others, and a distinct rarity.